This is something going around Facebook, so I'm sure a few of you have already seen it but I decided to put it up here for the loyal blog readers who are feeling neglected. =) This was supposed to be the last part in an older post where I got tagged, but I didn't realize it until a while later. 1. I took ballet for 10 years when I was growing up. I stopped when I couldn't get toe shoes big enough for me anymore. 2. I had a ton of hair when I was a baby, and when my mom took me to the mall in a little baby pack, an old lady asked if she could pet her puppy. 3. My first car was an '87 Isuzu Trooper stick shift. My mom made most of my family sit in it while I was learning how to drive it... I'll never live that down. 4. I have superhuman hearing and can hear the smallest little sounds from across a room, but have a hard time hearing people when they're right next to me talking to me. 5. I was an all-state setter on my volleyball team in high school up in Virginia. 6. Other sports I played in high school were basketball, softball, and tennis. 7. I was addicted to AOL Instant Messenger in college. I would compulsively check away messages and that's how I found out about the attacks on 9-11. 9. I do not have a green thumb. I have such a hard time keeping plants alive. 10. My nose runs when I eat... it doesn't even have to be hot food. 11. I was on a swim team when I was younger and my best stroke was the breast stroke. 12. I went to the University of Tennessee and my blood runs orange! I picked up a southern accent that comes out when I go back to visit. 13. Since I like wrapping presents, my mom would have me wrap all the xmas presents except mine. 14. Oh and speaking of xmas, I found out that Santa Claus wasn't real because I noticed he had the same handwriting as my dad... "all men have the same handwriting" was the explanation my dad tried to hold me over with. 15. I am very OCD. Everything on my desk has to be at right angles. 16. I can't chew gum for very long because my jaw locks up. 17. My husband's grandmom taught me how to crochet after I graduated from college. Since then, I've made about 10 full size blankets that can cover a queen sized bed each. 18. I love assembling that put-it-together-yourself furniture. 19. I had 2 beagles growing up so I think they are the cutest dogs ever! 20. I've never been out of the country but I have my passport ready and waiting. 21. My first job was a lifeguard. Over the 4 summers I worked, I only had to save a total of 2 kids. 22. I have enough hair for 2 people. And at the rate it sheds, that is pretty amazing. 23. I don't think I'm lactose intolerant but I get crazy stomach cramps when I have sour cream, white milk, and heavy whipping cream (I really enjoyed that lobster bisque the one time I ate it, and later found out that it was a one-time-deal). 24. I took a wheel thrown pottery class a couple years ago and still have close to 30 pots and bowls. We actually use some of the bowls for soup! 25. I grew up eating venison... for those that don't know, that's deer meat. I had a good number of friends growing up that would steer clear of the garage during hunting season because they got surprised by a deer hanging in there. #2 made me lol!!! #18 you are more man than i! that is the hardest most frustrating thing to do ever! Awesome! If I ever visit your desk I'm gonna give it the Jim v. Dwight treatment .... muuuhahahahaha! I am new to your blog Erin and I love your work. Ballet,OCD and lifeguard; very interesting combinations. 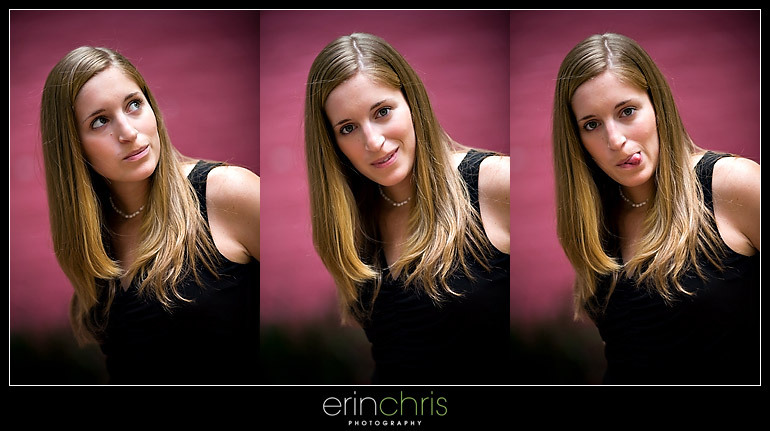 Hey Erin... it was great seeing you and Chris in Vegas, I hope the trip turned out alright for you :) It was great getting to know you a little better through the above post too. Keep up the great work!